LOS ANGELES, Calif. - With the Los Angeles Kings surging toward the playoffs on an eight-game winning streak, general manager Dean Lombardi decided to go all in on another Stanley Cup run. 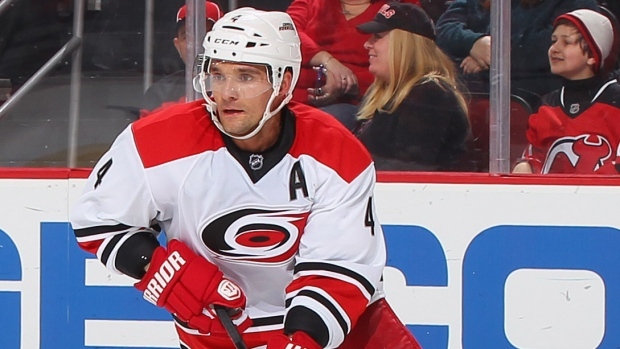 The Kings acquired defenceman Andrej Sekera from the Carolina Hurricanes on Wednesday, trading prospect Roland McKeown and a conditional first-round draft pick to bolster the defending champions' blue line. The 28-year-old Sekera has two goals and 17 assists in 57 games with the Hurricanes this season after recording a career-high 44 points last season. The dependable two-way Slovak veteran can be an unrestricted free agent this summer, and the Kings gave up two valuable assets to get him. But Los Angeles has made a formidable surge back into playoff position with three straight weeks of unbeaten hockey, and Lombardi decided the current group of champions deserved the best chance to repeat. "From what they've accomplished the last three years and the way they appear to be responding the last couple of weeks, the players dictate a lot of what you do," Lombardi said. "Given what they've accomplished and the way they've responded here, you say, 'You know what? Let's get aggressive here.' The way they kept fighting through, it's almost like you owe it to them." Lombardi added a big-name veteran late in the regular season before each of the Kings' last three playoff runs, picking up Jeff Carter in 2012 and Marian Gaborik last season on the way to titles. In 2013, he added Robyn Regehr, Sekera's former defensive partner in Buffalo. Sekera is a top-tier defenceman who appears to fit in well with the Kings, who have allowed just six goals in their last five games while streaking into third place in the Pacific Division. "He's a competitive guy," Lombardi said. "We have no issues as far as him fitting in here with this group. No question he's going to be hungry. I think there's things he can bring to us. He's very mobile, and even though he's not big, he sure competes. He's a smart player. It was a definite chance to upgrade this team." The Kings have been thin on defence all season in the absence of Slava Voynov, who was suspended six games into the year after his arrest and subsequent charges of domestic violence. Voynov will miss his 54th consecutive game Thursday when the Kings host Ottawa under what has become one of the longest suspensions in NHL history. The Kings have no idea whether Voynov could return to uniform this season, but obviously aren't counting on it. His trial is scheduled for early March, but it could be delayed. Los Angeles also lost defenceman Alec Martinez to an apparent concussion earlier this month. The Stanley Cup finals hero has missed seven straight games, and the timetable for his return is uncertain. Sekera was traded to Carolina in 2013 after playing his first seven NHL seasons with the Sabres. He is making $1.75 million this season, and his arrival won't wreck the Kings' precarious salary cap situation, Lombardi said. The last-place Hurricanes went into rebuilding mode Wednesday, moving veterans for future assets. Carolina also acquired two draft picks from Winnipeg for forward Jiri Tlusty, who also can be an unrestricted free agent this summer. The first-round pick acquired by the Hurricanes will be this summer's choice if the Kings make the playoffs, or next summer if the Kings miss the upcoming post-season. The Kings drafted McKeown in the second round last year. The 19-year-old defenceman is the captain of the Ontario Hockey League's Kingston Frontenacs and has played for Canada in several international competitions.